When music legend Glen Campbell developed dementia, his wife Kim became his 24-hour caregiver. But after several years, Kim realized she needed more help. Glen was slipping into the final stages of Alzheimer’s disease, the most common form of dementia and the 6th leading cause of death in the United States. Glen had become increasingly confused, anxious, and combative. Kim could no longer bathe her husband of 34 years without a fight, and she worried he’d leave the house in the middle of the night. It has been five years since Glen was diagnosed; now it was time for him to move into a facility with 24-hour supervision, as they had planned years earlier. How Long Does End-Stage Dementia Last? Studies show that end-stage dementia life expectancy is about 8-12 years after initial diagnosis and more than 5 million people are living with the disease. Read on to learn more about end-state dementia. Or click here to get hospice eligibility requirements for end-stage dementia. The early years, filled with increasing memory lapses, are a constant reminder that it’s important to plan for the future. Patients and families must prepare for the more challenging symptoms of end-stage dementia – and the intense level of care required. During the early stages, your loved one may still drive, take part in social activities, volunteer, and even work. As a caregiver, this is your opportunity to talk about the future, including legal, financial, and long-term care planning. 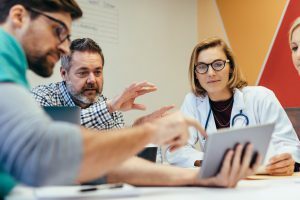 As every patient is different, and it’s difficult to accurately, predict how long end-stage dementia will last, planning ahead can help alleviate potential issues down the road. Radio personality Casey Kasem was diagnosed in 2007 with Lewy Body dementia, the most misdiagnosed form of dementia. Casey’s end-of-life care, like Glen Campbell’s, made headlines for different reasons. As Casey lived out his final days, the family feuded over the best care options for him. Casey’s children said they were complying with their father’s wishes to die comfortably and peacefully surrounded by family and friends, while his wife claimed they were ceding care and prematurely ending Casey’s life. Making healthcare decisions early and putting them in writing is essential. It will help avoid confusion about your loved one’s wishes. Knowing these wishes will also bring you peace of mind and the ability to make the best decisions regarding care. If you live in South Jersey and you or a loved one has dementia or another life-limiting illness, please contact Samaritan to learn how we can help. We can be reached 24/7 at (800) 229-8183. As this heart-breaking disease progresses, your loved one will have a difficult time expressing thoughts and performing tasks. 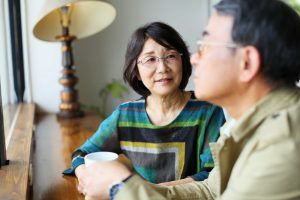 According to Alz.org, you may notice your loved one jumbling words, having trouble dressing, getting frustrated or angry, or acting in unexpected ways, such as refusing to bathe. “Rosemary tells me Bob has been getting increasingly more agitated when he has a bath from the home health aide. She says the aide is so patient and gentle, but she’s worried she’ll be upset by Bob’s behavior. have difficulty transferring to/from bed, chair, toilet, etc. An estimated 1.8 million people in the United States are in the final stages of dementing illnesses, and each person experiences the illness in their own individual way. The life-expectancy of a person with dementia is unpredictable, according to Dementia Today. End-Stage Dementia: When is Hospice Called In? 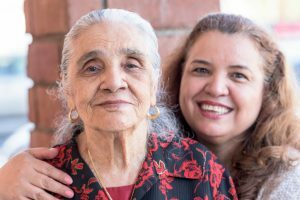 Caring for a loved one with any form of dementia, including Alzheimer’s disease, can become extremely challenging for the patient’s caregivers. Often families do not know where to turn for much-needed help. This is when hospice care can make a huge difference. Calling hospice is getting help, not giving up. The sooner you call, the sooner you will gain access to the comfort, support, and quality-of-life hospice care provides. To qualify, an end-stage dementia patient’s life expectancy must be six months or less, as determined by a physician. However, don’t let any questions you have regarding this qualification, or hospice eligibility criteria, prevent you from calling for hospice services. Hospice care services focuses on caring, not curing. Hospice care team members help manage pain, anxiety and other symptoms, focusing on your loved one’s physical and emotional comfort. Hospice also supports the family in its caregiving and grief-related needs. 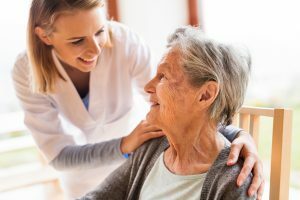 Hospice care is provided by the hospice’s doctors, nurses, home health aides, social workers, spiritual support counselors, and trained volunteers under the direction of the hospice physician and in conjunction with the attending physician. If you live in South Jersey and you or a loved one has dementia or another life-limiting illness, please contact Samaritan to learn how we can help. We can be reached 24/7 at (855) 337-2808. 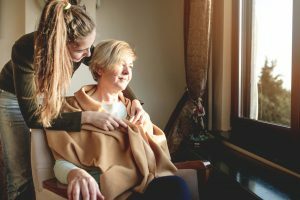 Dementia is a unique disease process that creates an unusual situation: the person with dementia gradually recedes from their loved ones while still alive. That is, the family loses the person they loved before physical death occurs. 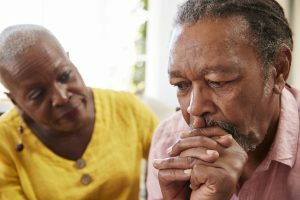 The grief that results from the significant losses in dementia is called dementia grief and it has unique aspects, properties, and processes. The role of the hospice care team is to support the family caregiver through this type of grief, and the other stresses of tending to a loved one with end-stage dementia. The team ensures patients and families maintain their comfort and dignity, while supporting their best possible quality of life. Hospice care is provided by the hospice’s, nurses, home health aides, social workers, spiritual support counselors, and trained volunteers under the direction of the hospice physician and in conjunction with the attending physician. The family also plays an important part in caregiving. Medical care, including regular visits by a nurse and other team members, and oversight by a palliative/hospice physician. Medications and medical equipment to reduce symptoms and pain. Medical supplies, from wound dressings to incontinence products. Education and support for caregivers, to help them care for the patient safely and effectively. Counseling about the emotional and spiritual impact of dementia and the end of life. Respite care to give breaks to caregivers. 24/7 access to the on-call team, enhancing families’ peace of mind. Grief support for the family. 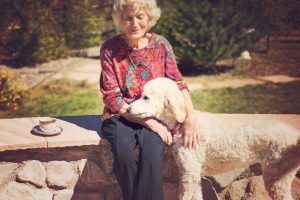 The goal of hospice is not to cure a disease, but to control its effects so your loved one can maintain their dignity and remain as comfortable as possible during the phase of end-stage dementia. The benefit of hospice care is that it facilitates the best possible quality of life, as defined by you and your and family. Most hospice care is provided where the patient lives, whether at home or in a care facility. Some patients receive hospice care in dedicated inpatient hospice facility, if they are experiencing severe pain or other symptoms associated with their terminal diagnosis that cannot be managed in their current setting. Strong history of serving dementia/Alzheimer’s patients and families. Year the agency opened; at least 20 years of experience is preferable. Hospice-certified nurses and doctors on staff and available around-the-clock. Specialized services to improve the patient’s comfort, such as massage and music therapy. Medicare certification. This requires the hospice to follow Medicare regulations, and is necessary to receive Medicare or Medicaid coverage of hospice services. Hospice care services help families cope with the demands of caring for a loved one with end-stage dementia.